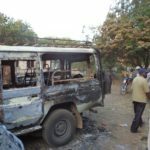 Al-Shabaab, the Al-Qaeda-linked Islamist militia, said it carried out an attack on Christians traveling on a Nairobi-bound bus in northeastern Kenya, killing 28 people. The attack is linked with a crackdown on at least four mosques in Mombasa where police arrested at least 350 people and seized weapons including hand grenades and petrol bombs, along with jihadist literature. In October 2011 Kenya sent its troops to neighboring Somalia to fight Al-Shabaab and since then it has faced increasing attacks by Islamist militants. Al-Shabaab has waged an insurgency against Somalia’s government since 2006.